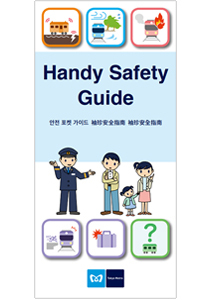 The Handy Safety Guide is a brochure explaining the measures taken to ensure the safety of commuters, emergency procedures and important points to consider during an emergency situation. The guide includes illustrations for easy understanding for all age groups. We believe developing understanding and interest about safety at Tokyo Metro will lead to calmer actions taken during emergencies as well as ensuring the safety of our commuters in a prompt manner.